Sorry for the silence lately. I’ve been busy with clients (19 this weekend, thank you very much), trying to convince a French bank to give me a mortgage (not quite the success we’re having with the company, afraid to say), and capitalizing on the last few weeks I have with my wife before she heads to Le Nord for an art residency. The next week is equally busy, but I’m here now to give you the crappy photos and bad commentary you are used to seeing. Above is part of Team VC at the start of Stage Five, in Les Deux Alps, which started with a 7 km downhill (always appreciated at 10 C). 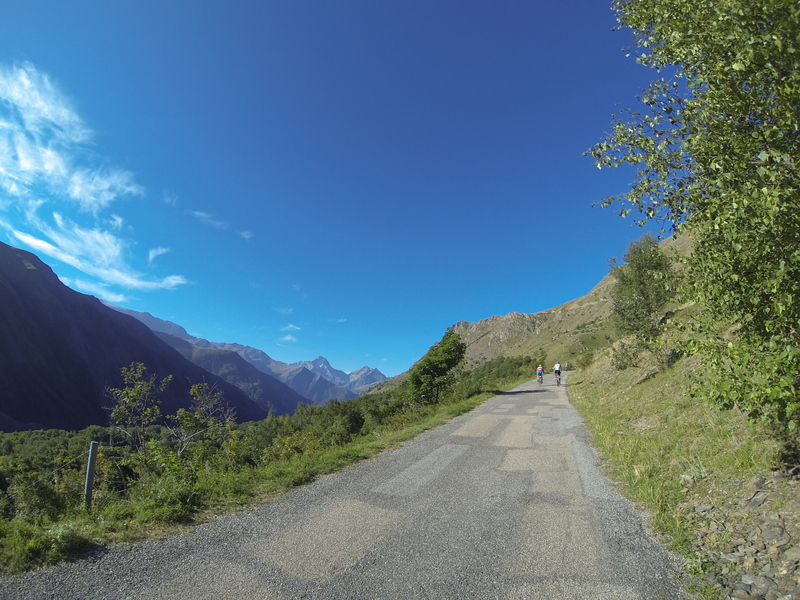 This descent turned out to be the highlight of my day because once we hit the first steep slopes of the Col de Sarenne, I found out that my Stage Four mojo had skipped town and deserted me. Luckily, I’ve been in this listless state many a time, so I just submerged myself into myself and watched the pebbles and sheep turds slowly pass by – till the last km of the climb, where I found some energy and at least finished well. After the Sarenne we bi-passed Alpe d’Huez and took the tiny route over to the beginning of the climb to the Col de la Croix de Fer. Now that I think back on it, I don’t think I climbed that one too badly, even gaining praise from someone even slower than me (he was observing from behind) on the steadiness of my pedal stroke (I’ll take it where I can get it). After a long descent back into the Maurienne valley I caught a small train of Brazilians, plus one ex-world champion skier, who transported me 30 km to the beginning of the last climb of the day, and my eternal nemesis – La Toussuire. It treated me a little better than the smack down I got the last time I climbed it in 2012, but ‘slog’ is an appropriate description of the way I climbed it, finishing the day in a disappointing (but no surprising) 217th. Stick around because the story does have a happy ending. But first I need to figure out where this goat cheese farm is that I’m taking my clients tomorrow. Congratulations on the 19 clients. That is very impressive. Follow your nose for the goat’s cheese farm. I look forward to the happy ending. We saw more than we could have imagined at the goat farm because the bucks were let loose with the females. Good thing we were all adults there. What an exciting life you lead. Having done it 3 times now and improving each time it’s never got easier, just faster. I don’t think it got any more enjoyable as expectations rose. Gotta tell it like it was, Mark! I’m tempted to go back and ‘do it right’, but must get into the off-season a bit more to work up the courage. Well done. Did the descent of the Sarenne when I was there for the 100th Tour. One of my best ever – loved it. I almost met my maker on that the last time I descended it. A beautiful road, though, no question. I can understand why! There’s quick & too quick! !